ISLAMABAD: The burqa brigade of Jamia Hafsa and slogans calling for ‘Jihad’ are back in the capital. Lal Masjid cleric Maulana Abdul Aziz came out of the mosque along with his wife, a daughter and well-wishers after Friday prayers during which he announced that a ‘campaign for the implementation of Sharia in the country’ will be launched. This was the second Friday that the cleric led prayers in the mosque after an absence of 10 months. In his Friday sermon, Maulana Aziz said he had been asked by the authorities not to take out any rally. On the other hand, the capital police and administration had warned the cleric that action would be taken against him if he was found involved in creating unrest in the city. The cleric has already been included in the police watch list under the Fourth Schedule of the Anti-Terrorism Act (ATA) 1997. However, Maulana Aziz asked those present at the mosque to support the ‘drive’ even if he was arrested. 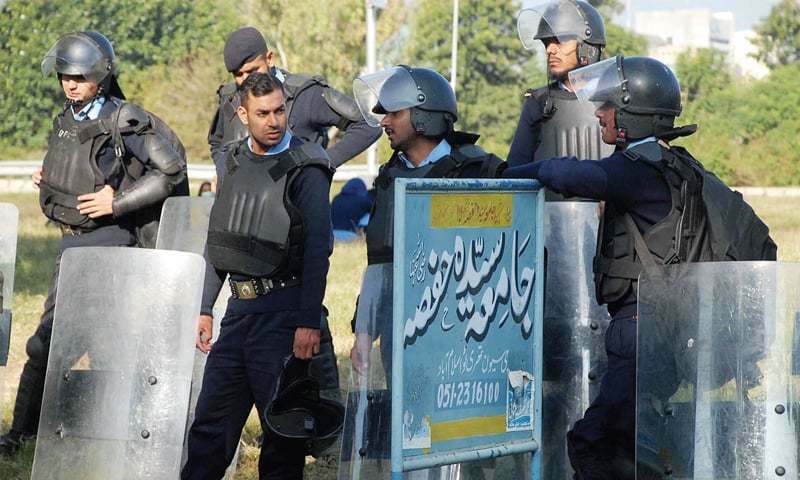 A heavy contingent of police and Rangers was deployed in the areas surrounding Lal Masjid. As soon as the prayers ended, Maulana Aziz’s wife Umme Hassaan emerged from a door of the mosque and confronted an officer of the Rangers. In the presence of media and her well-wishers, Ume Hassaan asked the officer what was he doing there. After the brief talks with the mediapersons, two double-cabin vehicles pulled up, one loaded with women burqa-clad guards who escorted Ume Hassaan and her daughter into their car. Ignoring the directives of the city administration and police, the cleric and his wife led a rally from the mosque located in Sector G-6 to Jamia Hafsa in G-7. The participants chanted slogans against the government and in favour of jihad, Maulana Aziz and implementation of Sharia. On January 2, 2015, Maulana Aziz delivered his Friday sermon at Lal Masjid after warrants for his arrest were issued. During the sermon, he threatened suicide bombings across the country if he was arrested. However, he stopped coming to the mosque the following week and occasionally delivered speeches during Friday prayers via telephone. The arrest warrants were issued after he continued to confront the authorities and reiterated that the attack on the Army Public School (APS) Peshawar on December 16, 2014, was justified as it was in reaction to the army’s actions in the tribal areas. Two days ago, Shuhada Foundation stated that on Nov 13 Maulana Aziz would make an announcement about the launch of a movement for the enforcement of Sharia. A rally would also be taken out from the mosque. After the announcement, senior officers of the Rangers and the capital police met the cleric and informed him about the consequences of making such an announcement. Sources said Maulana Aziz assured the officers that he would neither make any such announcement nor deliver hate speech. Besides, he was also reminded that “you are still under oath and have submitted an undertaking to the inspector general of police early this year that you would not be spreading hatred in the city,” they added. WOW. Absolutely amazing answer by the officer of the Rangers. I am really impressed with the calm demeanor the officer display. Well done Sir. There is no harm as long as the movement remains peaceful and doesn't interfere in government affairs. Testimony on the incompetency of the Govt and their failure to implement NAP. In this era, these kind of protests that too in a city is unheard of. It looks like the clamour is to go backwards towards stone age. The people and the government should resist suchbelements for the sake of the nation. Education and jobs are the key things which will eliminate such elements. Government lacks courage and vision to deal with the Lal Masjid issue.Not good. @Danish u r right. They have come back . Encouraged asthe government failed to implement NAP. Apprehension have to be carried out for the person who always pose problem for the state and it is mater of concern that they are playing with live of masses. @Shaukat Ali Khan . Wah what a vision !!!! Its looks like the government is either not serious or they are afraid of this man who blackmails and harms the State. Punish them by stopping media coverage. Previous incident should not repeated again. Because life is precious. Why are these people not being arrested and charged with revolt against the State? As long as it is legitimate political activity it should be tolerated, we might not like their views but they have a right to air them. The moment anyone does anything remotely illegal, cracked down hard. Let Abdul Aziz first clarify which Sharia he is talking about. First he should follow the Sharia he believes in. Islam does not allow someone to use threats in order to accept demands. Abdul Aziz is violating the basic principles of Islam. Tine to do away with these HE and SHE maulanas. Where are the haters of Musharaf now ? Why Sir jee, it is democracy. If certain clerics want to participate in the political activity then they should do so from a political platform and not from the platform of places of worship. Political lectures or comments by clerics should be banned in the places of worship by law. Faithfuls go there to pray and not to listen to the political views of the clergymen. Use of religion for political gains need prohibition by law to be enacted by the parliament. Places of worship are to be meant for worship alone.